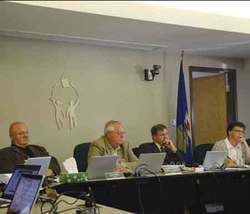 There will be no change to the number of schools in Wetaskiwin Regional Public Schools after the May 27 meeting. Members of the Wetaskiwin Regional Public Schools Board of Trustees voted to keep Pipestone and Lakedell schools open. The difficult decision was made following a 3 hour discussion and debate between concerned parents and the Board. Concerns by parents and residents surrounding the Lakedell and Pipestone schools were intensified on January 13th, 2014 when they were formally informed by letter of the Board of Trustees decision on Tuesday, September 24, 2013 to undertake a review of education programs and services at the Lakedell and Pipestone schools. The Board stated the review was undertaken as part of the Board’s mandate to provide quality education programs and services to students. The motion marked the beginning of a formal eight (8) month investigation into the implications of either closing or keeping the schools open. On Tuesday, May 27, 2014 approximately 50 parents, students and other interested individuals gathered in the WRPS boardroom to discuss the potential closures and consolidating the students to the Falun School. After a thorough and impassioned discussion the Board determined it was in the best interest of students and the communities to continue to deliver educational programming to students at Lakedell and Pipestone schools.